Gears: Mobike and Capital Bikeshare use 3-speed bikes. So are the LimeBikes I tried, but apparently some are 8-speed bikes. The 3-speed ones I rode are geared lower (not as fast) than the Mobike or CaBi bikes, so they're likely to be a bit better on hills but you'll mostly just be using gear 3 in flat areas. The Spin bikes, meanwhile, are single-speed. One speed might be okay in the flat central part of DC (but even there, I definitely missed the extra gears) but I doubt it'll fly in the hillier rest of the city. And if Arlington allows these, you'll need gears to get up those hills at Rosslyn (and others)! Spin (left), with standard wheels, and Mobike (right), with 5-spoke wheels. Image by the author. Construction: All of the bikes are heavier than most personal bikes but lighter than the rugged Capital Bikeshare bikes. It's too early to know how durable the bikes will be, but the general business model for the companies involves replacing them more often (2-5 years). I did already have some rides on all platforms where some bikes felt smooth and some weren't as smooth. The Mobikes are clearly more custom-engineered than the other dockless entrants. Instead of standard bicycle wheels with the net of metal spokes, Mobike wheels are a single piece of metal with 5 heavier spokes. Representatives say the method comes from automobile design and makes it unappealing to steal the wheels, since they won't work on other bikes. And Mobike puts most of its brake and shift lines inside the frame, so they're less likely to get cut. The Spin bikes, on the other end of the spectrum, had one line which snapped together and you could disconnect them easily. This snaps apart easily. (We snapped it back together, of course.) Image by the author. Seats: Mobike and LimeBike have a lever in front of the seat you pull to lift it up and down. The LimeBike's mechanism has a spring, so it pops up easily but takes some force to push down. The number one complaint about the dockless bikes has come from tall riders. Neither of those two bike seats rise up high enough for people over about 6 foot to ride comfortably, and I heard secondhand of one very short person who said none of the seats go down quite far enough. So depending on your body type, you might find some or all to be infeasible or uncomfortable. Toby Sun, CEO of LimeBike, says this has been their number one type of feedback, and forthcoming bikes will have a different seat mechanism that can go higher. The Spin bikes have a standard quick release type seat. It does go higher, but to my surprise, you can pull the Spin bike's seat out completely. I hope that won't mean there will be a lot of seatless Spin bikes lying around! The Spin bike's seat comes out entirely. (But we put it back in.) Image by the author. Handlebars: The LimeBikes have more of a "beach cruiser" swept-back handlebar style. Capital Bikeshare, Mobike, and LimeBike all have a more upright design than most personal bikes people use for commuting; LimeBike puts the rider even more upright. Whether that's good or not will be a matter of personal preference. The LimeBike baskets are slightly larger than the others, which Sun says is a selling point for their bikes. The Spin ones are a bit smaller, with Mobike in the middle. The Mobike basket has one bonus: a fold-out cup holder. Mobike's cup holder. Image by the author. Sounds: The bikes have an alarm which sounds if they're moved more than a few feet. Companies bill that as a tool to keep people from stealing them. LimeBike's alarm is the most compelling: a voice actually says it will call the police if you move the bike. (I hope they didn't call the police when I moved one 3 feet to get a better picture!) They also play a little jingle when you unlock them. The first time, it's fairly long, and I was worried that it'd be super annoying, but it's short the rest of the time and kind of endearing. Pricing: Mobike, LimeBike, and Spin all offer 30-minute rides for $1. Mobike and LimeBike (use code HELLODC for LimeBike) are offering free rides until the end of September. Single rides on Capital Bikeshare are $2 (though single rides make up less of CaBi's business model). Mobike requires you to put in some money (at least $1) to start using the app (and you have to put $1 on to get the free rides). LimeBike lets you sign up and take a free ride (even after September) without entering any credit card information, and Spin requires a credit card but you don't have to pre-pay. Mobike and LimeBike offer discounts if you put more money on the account: for $5 you also get a free ride; $10, it's three free rides, and for $20, six. Mobike doesn't have memberships, but it has a "points" system where you earn points for taking rides, reporting broken bikes or bikes parked in bad spots, or inviting other people. But if you do bad things like "abandoning the bike when intercepted by police," you lose points. The wording suggests you can get cheaper rides if you have a higher score, but it doesn't specify if that's happening now or what discount you get. Payment: All of the apps take regular credit cards. Spin takes ApplePay as well, while the other two do not. User interface: The Mobike app also feels more spartan in its verbosity and a little clunkier in some subtle ways. For instance, my Wi-Fi was flaky, and when I, say, clicked the button to add money, it just did nothing; when I turned off Wi-Fi, it worked fine. But basically, the apps are about the same. Some people have reported trouble getting the apps to show the bikes. I've noticed there tends to be a lag between loading the map and the bikes appearing, but none of the apps show an icon telling you it's still loading, so you might not know if there are no bikes or just no data yet. 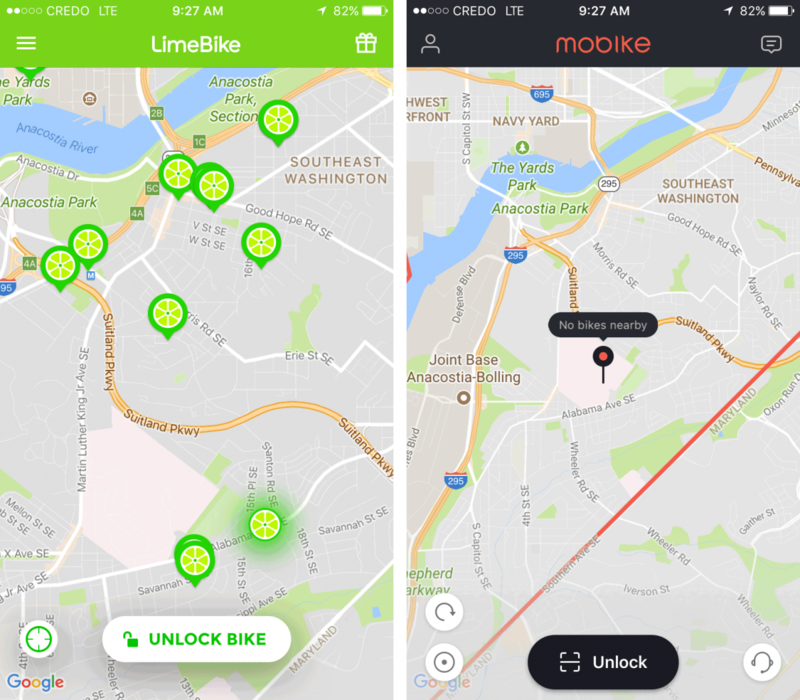 Privacy: The Mobike and LimeBike apps initially seem to require that you give them permission to track you even when you're not using the app, at least on iPhones. If you say "no" to the prompt to let it have your location even when not using the app, then the map won't scroll to your area. For any app, this is a bad privacy practice which Uber just abandoned after forcing it on users earlier this year. But actually, you can set them to only see your location when using the app (a better setting): for iPhones, go to Settings, Privacy, Location Services, then pick the app and set Allow Location Access to While Using the App. Then it works fine. Geofencing: You're not supposed to lock up the bikes on National Park Service land, like the Mall, or outside DC. I was able to do it anyway on both Mobike and LimeBike, the only two I tried doing this for. The Mobike app shows a boundary around DC excluding the Mall and related federal lands, while the other apps don't have the line. But the line doesn't appear to have actual functional effect. This LimeBike let me lock it in front of the White House, where it shouldn't be. (I then moved it.) Image by the author. According to Sun, the LimeBike CEO, rather than having the software prohibit locking in the wrong place, they instead just will send a rebalancing crew to remove bikes that are parked where they shouldn't be. They sent one to pick up these bikes in Arlington, for instance. I installed all three apps on my phone, but it's annoying to switch between them just to see which company has a bike near where I am. There's an open data standard, called GBFS (General Bikeshare Feed Specification), inspired by the similar GTFS standard for transit which lets all kinds of apps tell you what transit lines are near you and when the vehicles will arrive. So far, the companies do not support GBFS, but representatives for some of them said they are considering it. If the companies did support GBFS (either because they choose to or because regulations require it, which they should), you'd still have to open that company's app to reserve and pay, but at least you'd be able to find the nearest bike on a single app, or maybe a TransitScreen. And, researchers could analyze things like which services have good availability in various parts of the city. I found myself wandering around the intersection of 15th and K for a while, where the Mobike app clearly showed a bike (it appeared literally in the middle of K Street, where it definitely was not). I never found that one, actually, but ended up at a different cluster a block or so away. The app lets you make the bike "ring," but if it did, I certainly couldn't hear it over the truck, car, cafe, and construction noise at a bustling downtown spot like that. All of the services deal with this problem, because GPS is only precise to 16 feet. CaBi stations are big, and hard to miss. A single bike, if you just know it's somewhere on one side of the street or the other along the block, can be a tricky game of "find that bike." The permit to operate in DC requires all of the dockless systems to have bikes in all wards of the city. LimeBikes are now all over, while the other two still seem to be concentrated in the central part of DC, and as of Monday morning I can't find any Mobikes or Spin bikes east of the Anacostia (or in upper northwest or northeast). Bikes in Ward 8 as of Monday, September 25, around 9:30 am. Image by the author. It's still early, but this is something to watch. Ironically, on launch day I passed a Capital Bikeshare bike just parked on the sidewalk as if it were a dockless bike. Sorry, CaBi bikes didn't all turn dockless. CaBi isn't yet going to disappear. As above, if you're a frequent user, the $85 annual unlimited membership can be a great deal (ride more than once every 4.3 days and you save money over the dockless companies' per-ride charge). CaBi might have to drop its $2 single-trip price, though. CaBi is still the only operator in Arlington, Alexandria, Fairfax County, Montgomery County, and soon Prince George's County and the City or Fairfax. And while it's still too early to really know, there still aren't a lot of dockless bikes in low-density parts of the city. What have your experiences been? I'll also be trying electric bike service Jump soon and will post my thoughts.